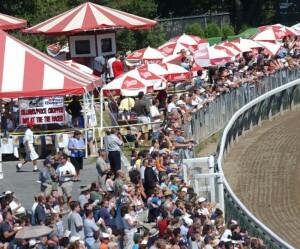 Schuylerville & Lake George Kick Off Saratoga Summer Spectacle: The 147th summer of thoroughbred racing at historic Saratoga Race Course gets under way on Friday with a 10-race card that includes the first two of 69 stakes worth a record $18.7 million during the 40-day meeting. Saratoga’s traditional opening day feature, the Grade 3, $150,000 Schuylerville for 2-year-old fillies, is joined this year by the Grade 2, $200,000 Lake George for 3-year-old turf fillies. 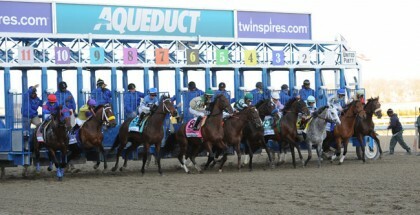 Post time for the first race is 1 p.m. Racing will be conducted six days a week, excluding Tuesdays, through Labor Day, September 7, highlighted by the 146th renewal of the Grade 1, $1.25 million Travers Stakes for 3-year-olds on Saturday, August. 29. Travers Day includes six other graded stakes, five of them Grade 1s, worth $4.6 million as one of three spectacular Saturday programs put together by the New York Racing Association. The others areAugust 8, offering five stakes worth $2.15 million anchored by the Grade 1, $1.25 million Whitney Handicap for older horses; and August 28, featuring six New York-bred stakes worth $1.15 million. Seven-time Eclipse Award winner Todd Pletcher looks to get a head start on his sixth straight Saratoga training championship and 12th overall when he sends out contenders in each of Friday’s stakes: impressive debut winner Positively Royal in the six-furlong Schuylerville and Grade 3 winner Feathered for the 1 1/16-mile Lake George. The 97th renewal of the Schuylerville is set for race 4; the 20th running of the Lake George will take place in race 9. 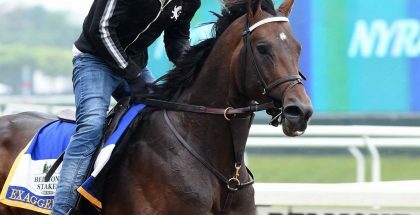 A bay daughter of champion Bernardini, Mathis Stables’ Positively Royal cruised to 3 ½-length victory in her June 18 unveiling at Belmont Park, covering five furlongs in 58.49 seconds. Pletcher, 48, has won the Schuylerville five times (2002, 2003, 2006, 2011, 2014) and gone on to take Saratoga’s training title in each of those years. Fellow defending meet champion Javier Castellano, looking for his third consecutive Spa riding title, has the mount from post 7. Trainer Wesley Ward will send out both Mark Dodson’s Banree and Ten Broeck Farm’s Moment Is Right for the Schuylerville. A daughter of multiple Grade 1 winner Medaglia d’Oro, Moment Is Right is unbeaten in two starts having romped over colts in her May 15 debut at Gulfstream Park and followed up with a front-running 1 ½-length score in the June 4 Astoria for fillies at Belmont Park. Banree, by Macho Uno, similarly beat colts in her debut April 16 at Keeneland Race Course and faced males again in the June 5 Tremont at Belmont but was taken out of her game following an awkward break and wound up a non-threatening fifth. Joel Rosario, up for the Astoria, gets a return call from post 6 on 121-pound top weight Moment Is Right, who spots two pounds to each of her rivals. Saratoga newcomer Rafael Hernandez will be back aboard Banree from post 8. Also entered are Decked Out and One Minute, who ran 2-3 in the Astoria; fellow stakes-placed Areolite; and debut winners Little Miss Miss and Off the Tracks. Pletcher has the lone graded stakes winner in the Lake George in Eclipse Thoroughbred Partners’ Feathered. In two starts since being moved to the turf this spring, the daughter of Indian Charlie won the Grade 3 Edgewood May 1 at Churchill Downs and was a stubborn second in the Grade 1 American Oaks 29 days later at Santa Anita. Feathered will be ridden for the first time by Luis Saez from post 10 at top weight of 123 pounds and cuts back from 1 1/8 miles for the Lake George, run at the same distance as the Edgewood. Pletcher won the Lake George in 2005 and 2006. Third in the Edgewood and second by a head in the Grade 3 Regret, Three Chimneys Farm’s Lady Zuzu is entered for Hall of Fame trainer D. Wayne Lukas, who captured the 2009 Lake George with Be Fair. 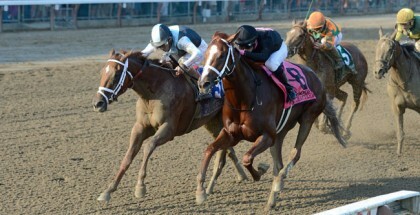 Most recently, the Dynaformer filly set a blistering pace before fading in the Grade 1 Belmont Oaks Invitational July 4. “We’re going to look at it. I’ll let the owner decide. I think she fits the race pretty good,” Lukas said. “The last race was a debacle with the rider. He just opened up and went unrealistic fractions. We’re going to change that. Corey Lanerie, riding at Saratoga full-time this summer, has the mount from post 8 at 115 pounds. Trainer Chad Brown is represented in the Lake George by three fillies: Mr. and Mrs. William Warren’s Mrs McDougal, Klaravich Stables’ Partisan Politics and Martin Schwartz’s Irish-bred Sivoliere. Partisan Politics is already a stakes winner at Saratoga, having taken the 1 1/16-mile P.G. Johnson last summer under Castellano, who returns to ride from outside post 12. She has been winless in three starts since, returning from a sixth-place finish in the Grade 1 Breeders’ Cup Juvenile Fillies Turf to run second by a nose in the Wild Applause Stakes June 14 in her sophomore debut. Unraced at 2, Mrs McDougal won her debut over the winter at Gulfstream Park and most recently was fourth by 2 ¾ lengths in the Grade 1 American Oaks. Sivoliere has been off the board in three North American starts since arriving last fall from France including a fourth-place finish in the Wild Applause, five lengths behind Partisan Politics. Sivoliere will break from post 6 under Jose Ortiz at 115 pounds, while Mrs McDougal will carry Irad Ortiz, Jr. and 117 pounds from post 9. Rounding out the field are Celestine, a winner of four straight starts including the Wild Applause for Hall of Fame trainer Bill Mott; Mississippi Delta, having captured three consecutive races including back-to-back stakes at Woodbine; Indy Star Stakes winner Cara Marie; All in Fun, Robillard, My Year Is a Day and Jellicle Ball, the latter making her U.S. debut for trainer Graham Motion.